Hi friends, so I had very good intentions this last week of bringing you some lovely recipes, but life happened as it almost always likes to do. We had an early morning trip to a&e with our girl, with a trampoline injury, thankfully it was only a badly sprained ankle, however she has been laid up all week and I have been chief nurse so I didn’t get much time to spend here on the blog. I did manage to get to London on Thursday evening though for a very lovely dinner with Parmesan UK, but more on that next week. For now I have a very tasty white pizza for you today. Before you run and gasp, white pizza?? Let me explain. We really love pizza here at chez Alston, well one of us more than the rest! Anyway while I tire very quickly of the same old pizza recipes all the time, our girl likes to have the same pizza all the time. So in an effort to find a pizza that could change things up a bit, yet be a pizza that everyone would enjoy, I thought I’d maybe give white pizza a go. And to my surprise everyone loved it. 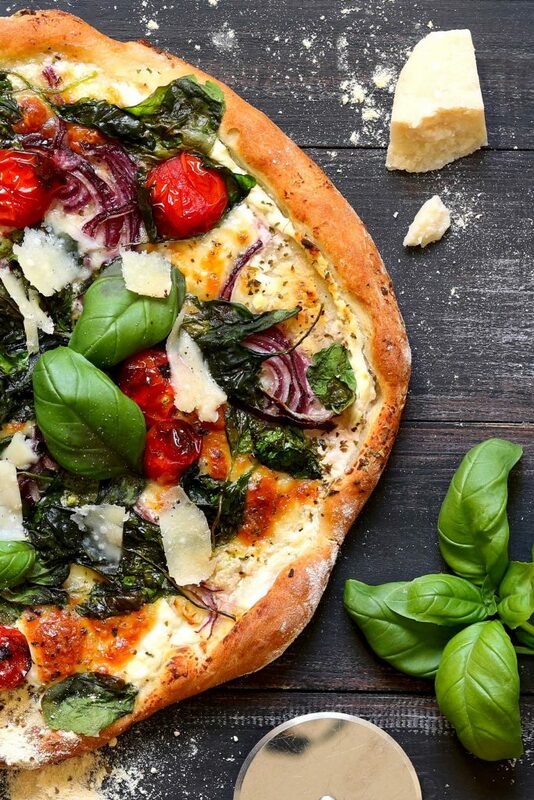 A white pizza with ricotta, mozzarella, spinach and burst cherry tomatoes. 200 ml / 1 cup of warm water , more if you need it. 200 g / 1 cup pf cherry tomatoes on the vine. For serving , fresh basil leaves, cracked black pepper and shavings of parmesan cheese. Pre heat the oven to 200 degree C/ 392 F, I use a fan assisted electric oven please adjust according to your own oven. Add the flour to a large bowl. Add the salt to one side of the flour then add the yeast and sugar to the other side. Make a well in the middle and pour in the warm water and olive oil. Mix with a spoon until you have a wet dough. Turn the dough out into a floured surface and knead for 5 minutes, add a little olive oil to the bowl then place the dough in the bowl. Cover with cling film and a tea towel then leave in a warm place for the dough to rise. In warm weather this should only take about 30 minutes. Then turn out the dough onto a floured surface and knead again for a couple of minutes. Divide the dough in half, using your knuckles make an edge in the dough then pull the dough out to make a good size round. Sprinkle an oven tray or pizza stone with polenta, place the pizza base on the tray. Add half the onions and top with half the spinach and tomatoes drizzle 1 tbs of olive oil over the pizza and season with a little cracked black pepper. Place on the top shelf of the oven and cook for 10 to 15 minutes until the cheese is golden, the tomatoes are burst and the base is cooked. Repeat for the next pizza. Serve with basil leaves and generous shavings of parmesan cheese. *US cup measurements are approximate, I use a metric scale and measuring jug to weigh and measure all ingredients. This pizza recipe is perfect! I love white pizzas and the combo of spinach and ricotta is divine! My mouth is watering! I’d love a slice of this right now for lunch. Looks terrific!